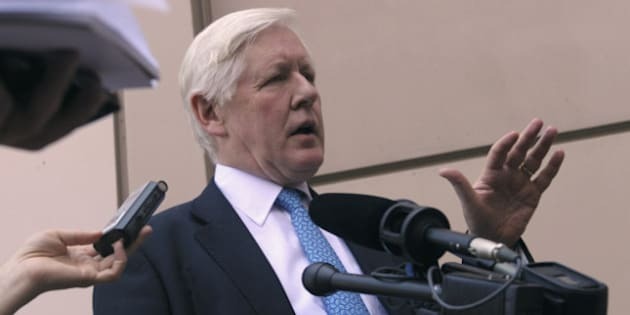 OTTAWA - Bob Rae says the Harper government's dogmatic approach to deficit and tax reduction risks driving Canada into an economic ditch. The Liberal leader says flexibility is required to manage an economy teetering on the brink of another recession. He maintains the government should be investing strategically in infrastructure, innovation, research and other measures that would stimulate the economy and create jobs. Instead, Rae says, the Conservative government is steering a rigidly ideological course, determined to cut taxes and slash spending no matter what. Rae made the comments Tuesday, one day before the release of the latest GDP results, which are expected to show Canada's economy stalled in the second quarter. "I don't think the Conservatives are focusing on jobs. I think the Conservatives are focusing on cuts," Rae said during a break from a Liberal caucus retreat. "I think what the Conservatives want to do is take this country on a forced march to austerity and I think they're doing it for ideological reasons." The government has invested heavily in infrastructure, particularly in response to the 2008-09 global recession when it racked up record deficits. But its multibillion-dollar stimulus plan has been largely wrapped up and the focus has shifted to returning to balanced budgets by 2015. Rae said it makes no sense to stick doggedly to that course as the economy sputters. "The economy is slowing down, of that there is no doubt," he said, noting that economists are debating whether it's already slipped into recession. "From the point of the view of the average person, this economy is not growing at the rate it needs to grow, this economy is not producing the jobs it needs to produce." Despite the worsening economy, Rae charged: "This government is paralysed by its adherence to ideology and to economic theory and it's not looking at what's really happening on the ground." Among other things, Rae said, the country needs an infrastructure program "where you don't just turn the tap on and off" or use it to invest in "gazebos in Huntsville for (Treasury Board President) Tony Clement." The Liberal caucus retreat is aimed at plotting strategy for the Sept. 19 resumption of Parliament. Rae is promising Liberals will mount vigorous opposition to the government's agenda and will push its own agenda of "jobs, jobs, jobs." The retreat is also discussing how to revitalize the once-mighty Liberal party, which was reduced to a rump of 34 seats in the May 2 election. The untimely death of NDP leader Jack Layton has reignited talk about a possible merger of Liberals and New Democrats. Two Liberal MPs mused publicly about the idea outside their retreat on Monday. But Rae said Liberals aren't interested in a merger and there's been no discussion of the idea behind closed doors. He called news stories about a renewed debate "fiction." "A debate will happen. But if somebody says to me, 'Is it a debate about something real?' my answer is No," Rae said. "I'm not running a political seminar here. I'm running a political party that's looking at real issues in front of it." The "real priorities" for Liberals, Rae said, are mounting an effective parliamentary opposition and rebuilding their shattered party — what he dubbed "the inspiration priority and the perspiration priority."